InspirationSL is a unique, luxurious shopping event that opens it's doors quarterly. Every round is based on a different, well known celebrity that has a unique style. Our designers take inspiration from this person to offer you themed, exclusive designs that can be found nowhere else on the grid, and each round runs for 3 weeks. 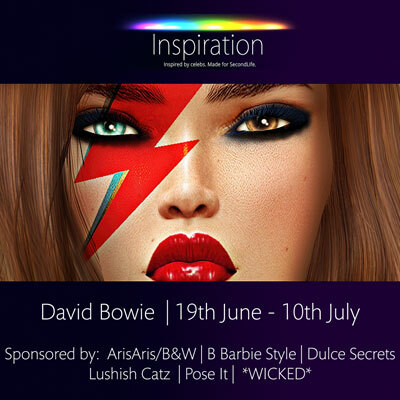 This round we bow down to the King of glam rock, as we celebrate the style and spirit of David Bowie. Come and check out the beautiful range of clothes, hair, accessories and makeup available to spruce up your rock god wardrobe!